If approved by the FDA, a new anti-VEGF agent could provide physicians with an alternative treatment for neovascular AMD. • The chemical composition of conbercept, an anti-VEGF agent approved in China, may give it added benefit when treating retinal diseases compared with other anti-VEGF agents. • A number of studies on conbercept have shown promise for the drug’s ability to treat neovascular AMD. • The drug’s history of treatment in China allows for an accelerated drug approval process in the United States. With approval of pegaptanib (Macugen, Valeant Pharmaceuticals) in December 2004 by the US Food and Drug Administration (FDA), a new era in the treatment of age-related macular degeneration (AMD) dawned. Anti-VEGF therapy quickly became the standard of care. Largely due to the FDA approvals of ranibizumab (Lucentis, Genentech) and aflibercept (Eylea, Regeneron) for neovascular AMD—plus the increasing off-label use of bevacizumab (Avastin, Genentech)—patients went from staving off vision loss during treatment to possibly even gaining visual acuity with treatment. Some patients do not respond to treatment with any of the above drugs, and others show evidence of either tachyphylaxis or increased intensity of disease that requires switching agents or intensive anti-VEGF therapy. 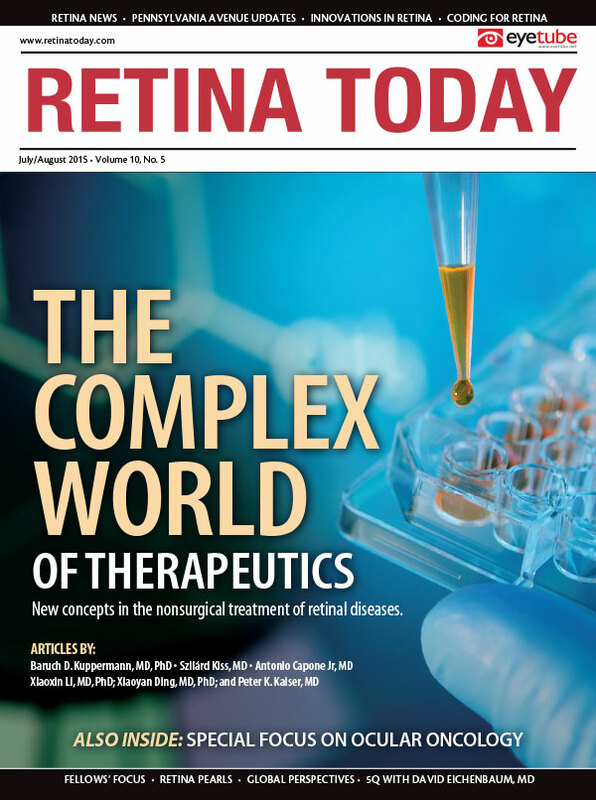 However, given the impressive treatment results with approved and off-label anti-VEGF agents, the availability of another anti-VEGF agent could present retina specialists with a new tool for treating patients with neovascular AMD. Conbercept (Lumitin, Chengdu Kang Hong Biotech) is an anti-VEGF agent that has been approved in China for treatment of neovascular AMD. Its chemical structure differs slightly from that of agents available in the United States, potentially providing a therapeutic advantage in the treatment of neovascular AMD. Whereas ranibizumab and bevacizumab block VEGF-A isoforms, conbercept and aflibercept block VEGF-A, VEGF-B, and placental growth factor. Similar to aflibercept, conbercept is a fusion protein consisting of the extracellular domain 2 of VEGF receptor (VEGFR) 1 and extracellular domains 3 and 4 of VEGFR2 combined with the Fc portion of the human immunoglobulin G1. The additional domains may allow conbercept to have a longer half-life than other anti-VEGF agents, which could mean that optimal treatment may be achieved with less-than-monthly or even bimonthly dosing. It also gives conbercept a higher binding affinity for VEGF than aflibercept. Various clinical trials have been conducted in China to assess the safety and efficacy of conbercept. For example, the phase 2 AURORA and phase 3 PHOENIX trials examined the effects of conbercept in patients with neovascular AMD. The LAMP trial was conducted in patients who were diagnosed with neovascular AMD but were ineligible for other trials due to extremely poor visual acuity. The AURORA trial was a randomized, double-masked, multicenter, controlled-dose, interval-ranging phase 2 trial with the primary endpoint of mean change in BCVA from baseline at month 3, and with secondary endpoints at month 12 measuring mean change in BCVA, mean change in central retinal thickness (CRT), and safety.1 Patients (n = 122) were randomized to receive 0.5 mg or 2.0 mg of intravitreal conbercept for three consecutive monthly loading doses. Following the third dose, patients were randomized to monthly or as-needed (PRN) treatment for the following 9 months of the study; the quantity of the dosage the patients received did not change throughout the study. At 3 months, following the loading doses, patients receiving 0.5 mg conbercept had a mean BCVA increase from baseline of 8.9 letters (P < .001); patients receiving 2.0 mg of conbercept had a mean increase of 10.4 letters (P < .001). The second part of the study, in which patients continued to receive the same dosage but were randomized to monthly or PRN regimens, lasted another 9 months. The improvements in BCVA from baseline observed during the first part of the trial were sustained in the second part. At month 12, patients in the 0.5-mg PRN group had a mean improvement of 14.3 letters (P = .002) compared with 9.3 letters in the 0.5-mg monthly group (P < .001). Patients in the 2.0-mg PRN group had a mean improvement of 12.4 letters (P = .007) compared with 15.4 letters in the 2.0-mg monthly group (P < .001). See the Table for a breakdown of BCVA improvement for all time and dosage points in the study. Optical coherence tomography (OCT) was used to measure CRT. At month 12, among patients treated with 0.5 mg conbercept, mean CRT measurements had decreased by 116.0 µm in the PRN group (P = .0056) and 131.6 µm in the monthly group (P = .005). Among patients treated with 2.0 mg of conbercept, those on the PRN regimen had a mean decrease of 157.8 µm (P = .003) and those on the monthly regimen had a mean decrease of 168.7 µm (P < .001). Reductions in leakage area, area of choroidal neovascularization, and lesion size were also statistically significant compared with baseline. The most common adverse events in the study were injection related, and the rate of ocular adverse events was low. No retinal detachments or tears were reported. The PHOENIX trial was a phase 3 registration study that explored the effects of prompt versus delayed treatment with conbercept for neovascular AMD.2 Patients (n = 124) were treatment-naïve and were randomized to either an immediate or a delayed dosing regimen. Patients in the immediate-treatment arm of the study received 0.5 mg conbercept monthly for 3 months, followed by a 0.5-mg dose every 3 months thereafter. Those in the delayed treatment arm received sham injections monthly for 3 months, followed by 0.5 mg conbercept monthly for 3 months, and then a 0.5-mg dose every 3 months thereafter. The primary outcome was the mean change from baseline in BCVA at month 3. Visual and anatomic measurements taken at 3 months showed that patients in the immediate-treatment arm had a mean 9.2-letter improvement from baseline and a mean decrease in CRT of 79.2 µm, which were statistically significantly greater than results in the delayed treatment arm. At month 12, patients in the immediate-treatment arm had a mean improvement of 10.0 letters and a reduction in CRT of 90.0 µm. This indicates that quarterly dosing, unlike what was observed in the PIER study with ranibizumab,3 led to stable vision gains with conbercept. There is little clinical trial evidence for eyes with very low visual acuities (≤ 19 letters or 20/200 vision) due to neovascular AMD because in general patients with extremely low vision are excluded from clinical trials assessing the effect of anti-VEGF treatment on neovascular AMD. Low screening rates in Asia, however, have led to a large population of patients with extremely low visual acuity due to neovascular AMD. The LAMP trial was a single-center study examining the safety and efficacy of conbercept in patients with visual acuity less than 19 letters due to neovascular AMD.4 Patients were excluded from the study if they received laser or drug treatment for choroidal neovascularization within the prior 6 months. The primary outcome of the study was the percentage of patients with BCVA gains of at least 19 letters. To date, the study results have been positive,5 and publication of data is planned. Conbercept is similar to aflibercept and has shown excellent visual acuity gains, reduction in retinal thickness, and safety in Chinese patients with neovascular AMD. The longevity appears to be enhanced by the additional domains, and there is the possibility that this drug can be dosed every 3 months as opposed to every 2 months (as is the case with aflibercept) or monthly (as is the case with bevacizumab and ranibizumab). This would be a welcome addition to our toolbox because reducing injections while maintaining vision gains is paramount. Conbercept is unique compared with other anti-VEGF drugs in that all previous studies were performed outside the United States, and the product is approved by Chinese drug authorities. Thus, there is considerable human data demonstrating safety and efficacy. As such, it is likely that the drug can skip phases 1 and 2 and immediately be entered into phase 3 testing in the United States and European Union. This should dramatically accelerate time to approval. Moreover, the positive results in China make the chance for successful registration outside of China encouraging. Time will tell if the drug will gain approval from the FDA. Xiaoyan Ding, MD, PhD, is a professor in the vitreoretinal department of the Zhongshan Ophthalmic Center at Sun Yat-sen University in Guangzhou, China. Dr. Ding may be reached at dingxy75@gmail.com. Peter K. Kaiser, MD, is a professor of ophthalmology at the Cleveland Clinic Lerner College of Medicine; a staff surgeon in the vitreoretinal department at the Cole Eye Institute, Cleveland Clinic; and the founding director of the Digital Optical Coherence Tomography Reading Center (DOCTR) at the Cole Eye Institute. He is a consultant for Alcon, Bayer, Regeneron, Novartis, Genentech, Kanghong, Neurotech, Ophthotech, Ohr Pharmaceuticals, Aerpio, Allegro, and Formycon. He is a member of the Retina Today editorial board. Dr. Kaiser may be reached at pkkaiser@aol.com. Xiaoxin Li, MD, PhD, is the chairwoman of and a professor at the Eye Center and Eye Institute of Peking University People’s Hospital in Beijing, China. She is a member of the Retina Today editorial board. Dr. Li may be reached at Dr_lixiaoxin@163.com. 1. Li X, Xu G, Wang Y, et al. Safety and efficacy of conbercept in neovascular age-related macular degeneration: results from a 12-month randomized phase 2 study: AURORA study. Ophthalmology. 2014;121(9):1740-1747. 2. Kaiser PK. Conbercept clinical trials: a new anti-vascular endothelial growth factor therapy. Paper presented at: American Academy of Ophthalmology Annual Meeting; October 18-21, 2014; Chicago, Illinois. 3. Regillo CD, Brown DM, Abraham P, et al. Randomized, double-masked, sham-controlled trial of ranibizumab for neovascular age-related macular degeneration: PIER Study year 1. Am J Ophthalmol. 2008;145(2):239-248. 4. An Open, Single-center, Safety and Efficacy Study of Conbercept in Patients With Very Low Vision Secondary to Wet Age-related Macular Degeneration (wAMD) (LAMP). ClinTrials.gov. https://clinicaltrials.gov/ct2/show/NCT02098720. 5. Ding X. Conbercept in neovascular AMD patients with very poor visual acuity: the LAMP trial. Paper presented at: Angiogenesis, Exudation, and Degeneration 2015; February 7, 2015; Miami, Florida.